Flanked by Ygor and Frankenstein’s son Wolf, the semi-comatose Monster on its slab is about to be powered up by a jolt of crackling electricity. In the background, the hellish sulfur pit boils and smokes. The phenomenal success of Famous Monsters of Filmland, first of its kind in 1958, provoked a slew of imitations. Sales of the magazine were unaffected by all the copycat titles, suggesting that the monster magazine field was far from saturated and the Monster Kid dollar had some stretch to it. Rather than watch others pick up the slack, publisher Jim Warren launched his own in-house knockoff, Monster World, in 1964. 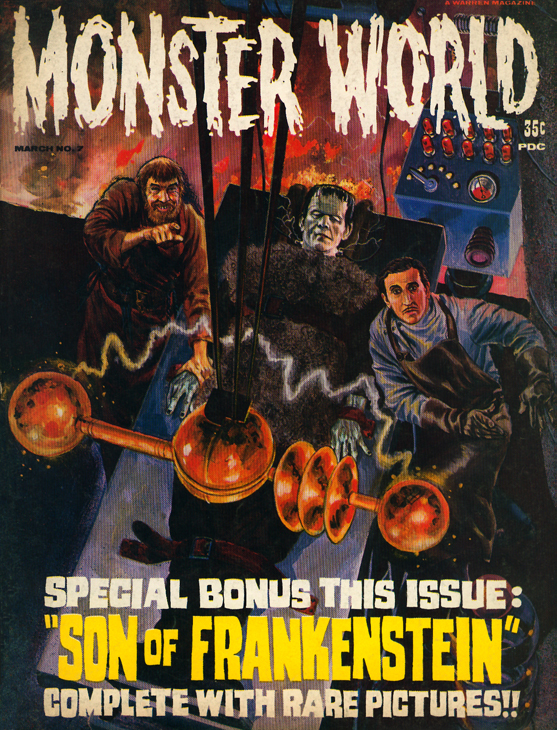 Edited by Forry Ackerman, the magazine was a carbon copy of the original, essentially extra issues of Famous Monsters under a different masthead. 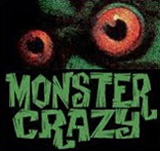 In fact, when Monster World was cancelled after 10 issues, its entire run was absorbed by Famous Monsters, and the flagship title’s numbering instantly jumped from No. 69 to No. 80. Artist Gray Morrow (1934-2001) provided an unusual and very effective plunging perspective cover for Monster World No. 7 (March 1965). Unlike the fully painted monster portraits that usually adorned Warren publications, this one is closer to a comic book esthetic, a colored line drawing depicting action, telling a story as it were, suggesting a scene from Son of Frankenstein (1939). 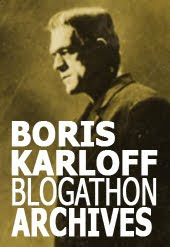 The dynamic design is augmented with groovy, blocky hand-drawn titles, probably the work of layout artist Harry Chester. See a Monster World cover gallery. Famous Monsters of Filmland Wiki page. I had that ish as a child. Good to see the vibrant cover again! Yeah, it’s dynamite. It’s got this vivid pulp magazine feel to it, Look at the hands, look at the expressions, it’s kinetic. And the layout, the lettering top and bottom, is terrific. It all works together to make a helluva cover. That picture is absolutely classic!